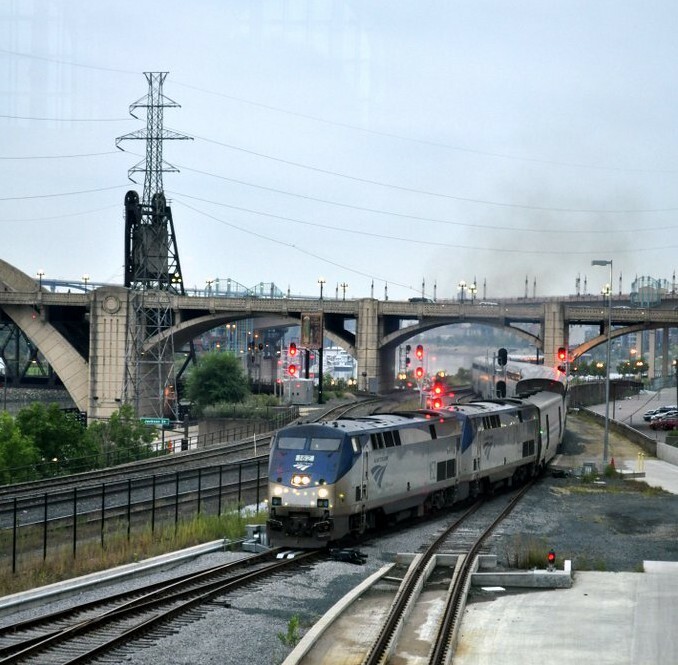 Letting the train take the strain – Amtrak-style | A balanced diet . . . 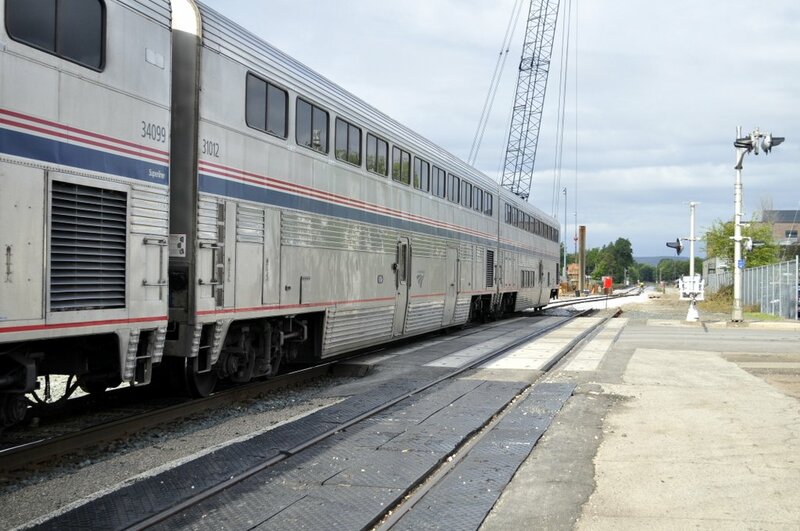 The Amtrak Empire Builder pulls into Union Depot on time, two days and about 1,800 miles after leaving Seattle¹, headed by two GE P42 Genesis locomotives. Destination: Union Station, Chicago. Another 400 miles and 8 hours travel, with intermediate stops at Red Wing and Winona in Minnesota, La Crosse, Tomah, Wisconsin Dells, Portage, Columbus and Milwaukee in Wisconsin, and Glenview (an outer suburb of Chicago) in Illinois. 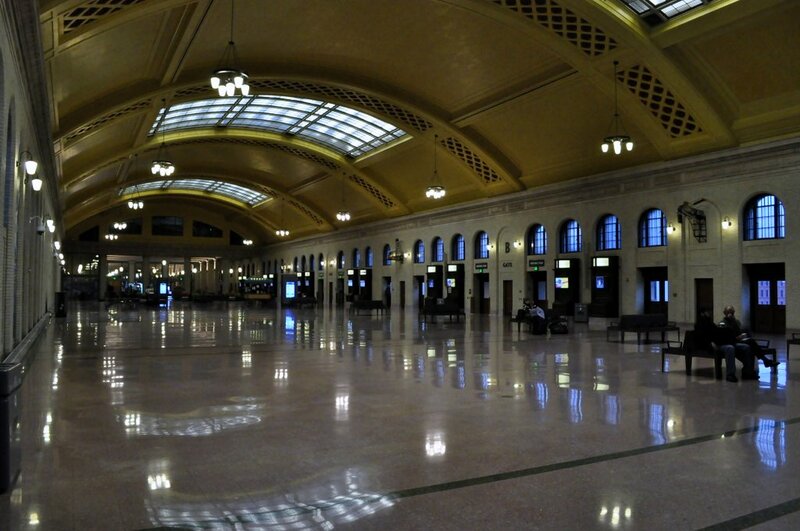 Until early 2014 Amtrak used the Midway depot (between Minneapolis and St Paul) as its station in the Twin Cities. 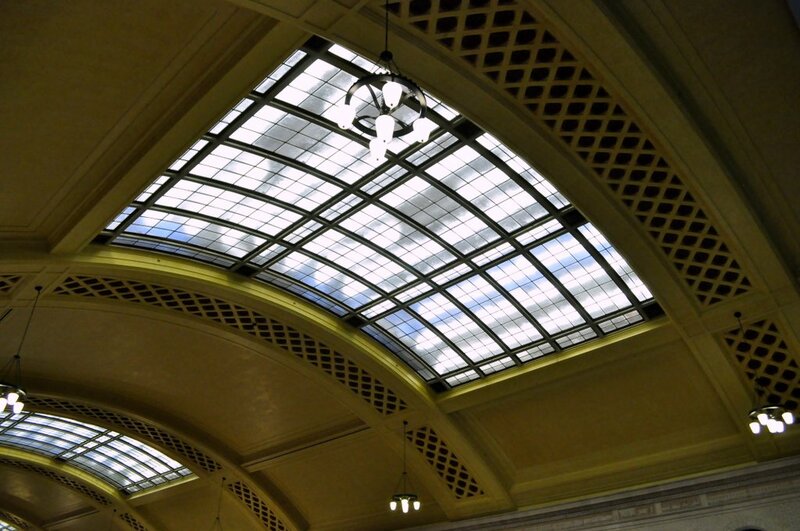 Now it operates out of the refurbished—and very plush—Union Depot in downtown St Paul, alongside the Mississippi River. Interestingly, Amtrak uses three-letter codes for all its stations, just like airports (MSP for St Paul-Minneapolis). We arrived to Union Depot with about 20 minutes to spare, found our way to the exit gate, and joined the other passengers (around 40) waiting to board the train that was due in a few minutes later. Once all St Paul passengers had ‘de-trained’, we were assigned our coach at the departure gate, and made our way down to the platform. The train consisted of a single-decker baggage railcar just behind the locomotives (you can just see it in the photo above), and a long set of sleeper cars and seating cars, a dining car, and an observation car. Seattle cars were at the front of the train, and those from Portland at the rear. Although we had reserved seats, we didn’t have actual seats assigned. 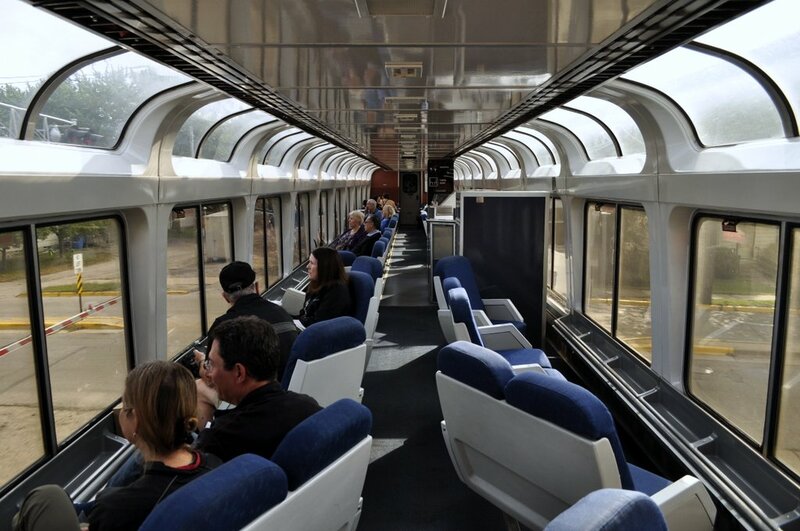 But as the railcars were not full, we just found the first empty seats available, all on the upper deck of each Superliner car. Fortunately, Amtrak does assign blocks of seats for couples traveling together, and those for passengers traveling alone. So it’s always possible to sit together. If the train is full, however, the conductor will assign specific seats. 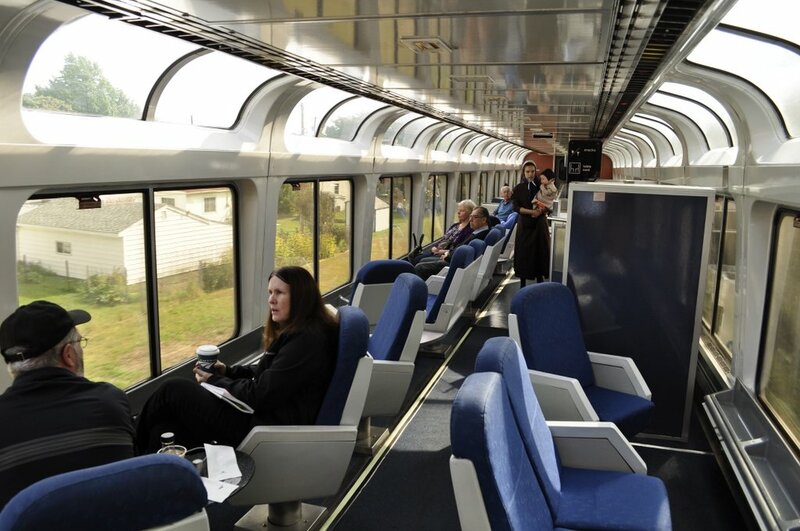 On both sectors we had no problem finding good seats, and down to Chicago, our car was immediately behind the observation car, with its snack bar on the lower level. All seats face forward, recline, there’s a foot-rest, and ample space between seats, more like the business class seating space on an aircraft. Since we only had hand luggage, this could be accommodated in the racks above our seats. There was plenty of space for larger luggage downstairs, and baggage could also be checked and stored in the baggage car. So, letting ‘the train take the strain’ we settled into our seats, anticipating the journey south to Chicago. We departed on time at 08:03, which is exceptional for Amtrak considering the issues this service has been facing in recent times. Delays of up to five hours have occurred on some sectors, especially west of St Paul. The Amtrak Empire Builder runs on tracks (often single tracks) owned by several freight companies², which take priority. So if extra freight trains are added to the schedule, or there’s a breakdown on one of the single track sections, for example, then Amtrak just has to fit in. Fortunately on both sectors of our Chicago jaunt, the trains ran to schedule and on time. About 20 miles south of St Paul, the railway crosses the Mississippi at Hastings over to the west bank. I didn’t even notice when that happened, as the river is quite narrow at this point. Not so, further south, as the river merges with a set of lakes. Where the railroad crosses the Mississippi over to the east bank near La Crosse, WI, it is most impressive as you can see in the Part 1 video (at around 13 minutes). From Hastings south to Red Wing and Winona, the railroad more or less hugs the bank of the Mississippi. After crossing the river, it heads east over mid-Wisconsin, often through extensive wetlands, but also mile upon mile of maize and soybeans. After Milwaukee, on the shore of Lake Michigan, it turns abruptly south, and after another 90 minutes or so, pulls into Chicago’s Union Station—as we did on time around 15:55. 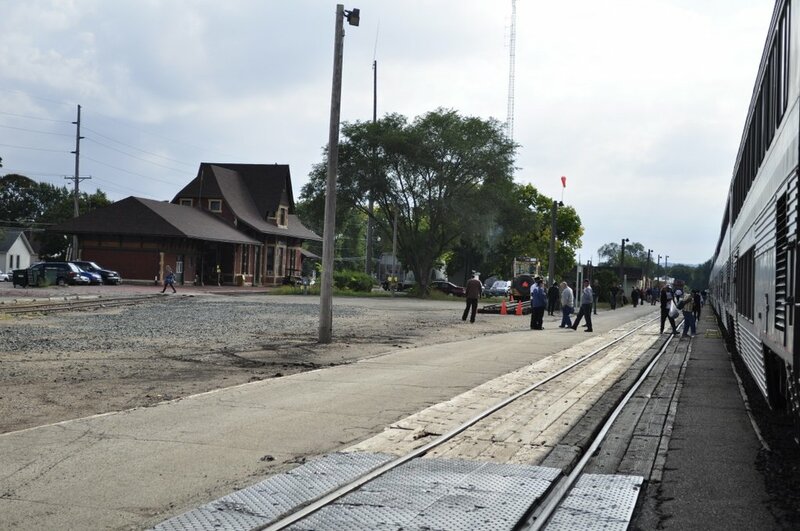 On both sectors there are slightly longer stops at Winona and Milwaukee to permit passengers to step off the train for a few minutes and stretch their legs and, if needs must, smoke. All Amtrak services are strictly No Smoking! On the journey to Chicago, we bought sandwiches in the snack bar. Big mistake! They were expensive, and dry, almost inedible slabs of bread (no butter or mayonnaise) with a turkey and cheese in between. As we had to leave the house early for our train we hadn’t had time to prepare anything. On the return journey we stocked up with supplies from a deli close to our hotel. Much tastier and better value. 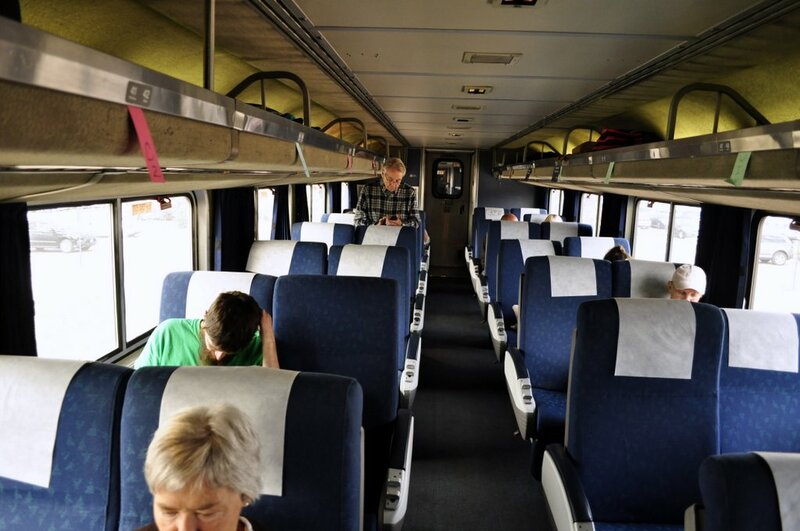 While many passengers (retirees in particular) take the Empire Builder for its relaxing way to travel across this vast country, for others rail travel is cheaper than flying. After all, our two return tickets cost only USD224. For others it’s really the only way they can travel. On both journeys there were many Amish (or were they Old Order Mennonites, or even Hutterites?) making their way to Chicago, or back to their communities in the far west in Montana. A young ‘Amish’ woman and her baby making their way through the observation car. On the return leg, there were four young ‘Amish’ women sitting in the row in front of us, chattering away in ‘Pennsylvania Dutch’, that strange Swiss-German dialect they have used since first arriving in the USA (you can hear them at the beginning of the Part 2 video). They were traveling to Malta, Montana, another 36 hours at least west from St Paul. Another young man seated near us was traveling on to Portland, OR. And only seated! I couldn’t do that. On a longer journey than our trip to Chicago, I would definitely choose the sleeper option, with all meals included. Was it a good trip? On the whole, yes. I love traveling by train, as I have posted elsewhere on this blog. Traveling by train allowed us to see new parts of the USA that we wouldn’t had we flown to Chicago—new communities, new landscapes, new agriculture. A pity though that Amtrak doesn’t clean the railcar windows more regularly (as you can see from the videos, unfortunately). Maybe another time, for a short trip like this one, I would travel by train one way, and return by air. That would certainly be the case for a transcontinental trip. Nevertheless, our trip was comfortable, interesting, on time, and with rail travel there is the distinct advantage of arriving in the center of the city. From Union Station in Chicago it was a short taxi ride to our hotel. I have one regret. We didn’t have time to look round Union Station. It was a bit of a maze to find our departure gate, so once there, we just waited for the gate to open (about 20 minutes) rather than wander off around the concourse, and I’m not sure in which direction that lay. Union Station is huge. Chicago is the terminal for many of the long-distance trains that Amtrak operates to California, the Midwest, and Texas among others. Of course, it was the city from where the 19th century railway building boom started. Parts of our journey used to be double track or more. Many lengths are now just single track. But looking at the landscapes, the rivers and wetlands that the railroad crossed again brings to mind the superhuman effort to build a trans-continental railway then. The state of the railway is quite poor in parts, although efforts are being made to upgrade different sections of the line. But almost exclusively existing wooden sleepers are being replaced by wooden sleepers. I hardly saw any concrete sleepers at all. And rail lengths are very short. This is in contrast to what you see in the UK and Europe, where all rail refurbishment is with concrete sleepers and extremely long lengths of steel rails welded together for a safer and smoother ride. With wooden sleepers about a foot or so apart, I hate to think just how many trees (and which species) have been sacrificed to build the railways. Crossing the Great Plains in the 19th century, sleepers were shipped in, were quite crude, and made from timber (often cottonwood) that didn’t survive for very long. Modern wooden sleepers are huge chunks of wood. And as you will see as you watch the two videos, there isn’t much segregation between the railroad and cars and people. Obviously the railroad follows today the original 19th century route, passing through the center of towns along the way. There are innumerable railroad crossings, and the locomotive engineer was constantly sounding his horn the whole journey as we approached the many roads crossing the line, or on entering towns. There are no fences, and the line often cuts across gardens of houses alongside the railroad. However, this Amtrak trip is another item ticked off my Bucket List. Time to start planning my next trip. ¹ Actually, the Empire Builder is two trains, one from Seattle and the other from Portland, OR that join to form a single train at Spokane, in eastern Washington State. ² BNSF Railway’s northern route from Seattle to Minneapolis, Minnesota Commercial from Minneapolis to St. Paul, Canadian Pacific from St. Paul to Glenview, and Metra from Glenview to Chicago. This entry was posted in Out and about, Travel and tagged Amtrak, Chicago, Empire Builder, Mississippi River, St Paul.